K-pop diva Sunmi has returned with the new single “Heroine,” and the song was plastered all over the internet Friday. The song’s music video and photos were posted on the singer’s official Facebook, Twitter and Instagram accounts, receiving thousands of likes and shares. “My new single ‘Heroine’ was just dropped. Please check this out,” Sunmi wrote on Instagram, along with a shortened version of the music video. The clip garnered over 643,000 views in eight hours, with fans leaving encouraging comments. However, the song has also sparked controversy: Netizens are saying that it is similar to British singer Cheryl Cole’s “Fight for This Love.” Teddy, the composer of “Heroine,” has also been swept up in the controversy. 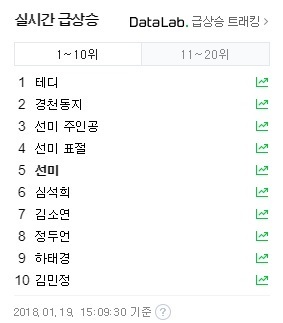 As of 3:10 p.m., the terms “Teddy,” “Sunmi Heroine,” “Sunmi Plagiarism” and “Sunmi” ranked first, third, fourth and fifth on Naver’s real-time trending bar. Media outlet WikiTree shared the news on its Facebook page with a caption saying “Hmm..,” and the post received over 2,300 likes and was shared over 200 times in about six hours. The singer’s agency told News1 on Friday afternoon that the company is looking into the issue, but it has not made an official comment yet.